In July 2011, Linda Conklin was water skiing during a family vacation in Virginia when a freak accident nearly caused her to lose her left foot. As her ski got snagged in the boat’s tow rope, Linda’s tibia and fibula snapped. Linda was airlifted to a nearby hospital with the prognosis that her foot would need to be amputated. But, incredibly, doctors were able to stave off infection and save her limb, performing 4 surgeries in 6 days, including a skin graft and muscle transplant. But for Linda saving the foot wasn’t enough. As a personal trainer and recreational marathon runner, she wanted to resume the athletic activities she loved. Her doctor was skeptical, warning Linda that she might spend the rest of her life walking with a limp. "I never thought I would run again, based on our conversations with him," Linda said. A month after the accident, Linda started physical therapy back home in Illinois with Patrick Chapman, PT, MS, but it was too soon to think about walking. Linda still had swelling in her leg and her skin was still tender from skin grafts. Regaining mobility and the strength required to bear her standing weight would take time. But Linda was determined, and once she progressed to being able to ride a stationary bike she started to believe she could overcome initial predictions. "This wasn't going to be easy, and it was going to take a long time, but if I did everything I was supposed to do I could possibly get back to running," Linda said. In April 2012, Linda had progressed to a slow jog on a treadmill. Three months later Linda completed 5k run. As of October 2013, when Linda was interviewed for Move Forward Radio, Linda was averaging runs of 5-6 miles, with an occasional 10-mile run, and with hopes of a possible half marathon in 2015. Ecstatic about her accomplishments, Linda credited her physical therapist. "Without him, I honest to god would not be where I am today," Linda said. 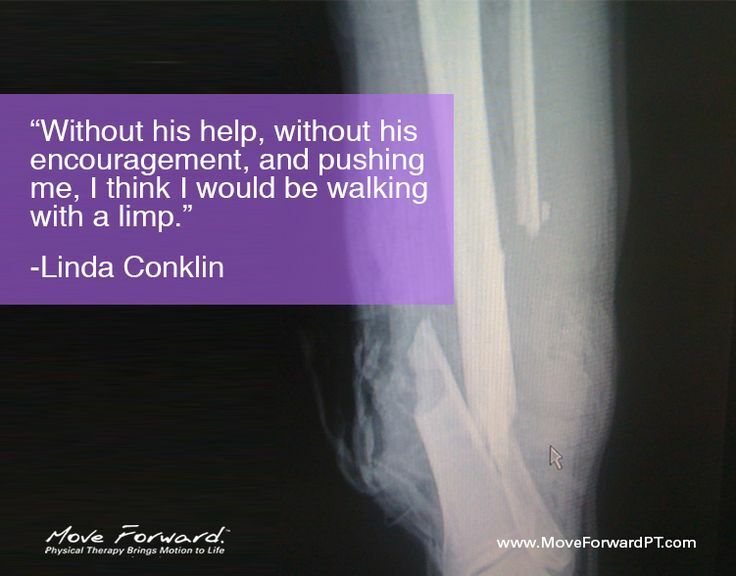 Listen to Linda's experience with physical therapy on Move Forward Radio.